We hear a number of complaints from pet owners about their carpet. From pet stains to chewing, there are a number of less desirable things that can happen to the carpet in a pet-friendly home. However, there is good news! You don’t have to give up your carpet (or your pet) to maintain a fresh look in your house. 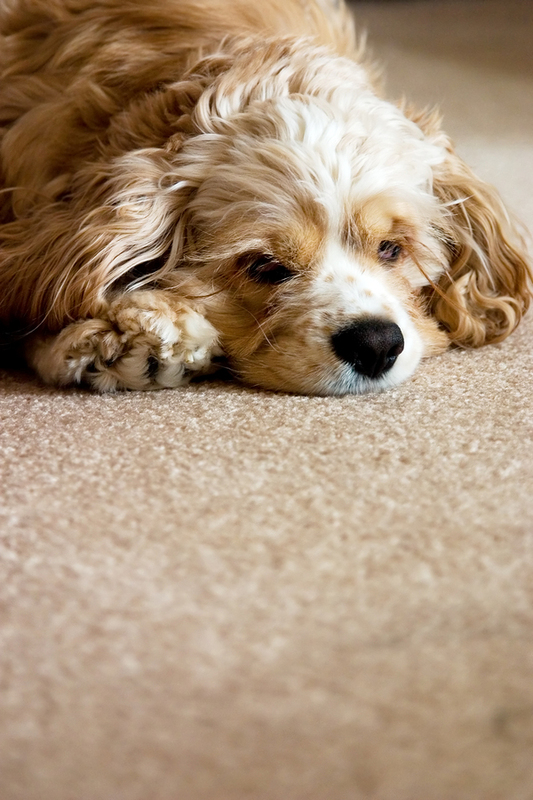 Here are 10 Tips For Keeping Carpets Clean With Pets. 1 – Mind the paws. Much of the dirt and grime that gets transferred into the home from a pet comes from their paws. Keep those paws clean to limit the damage to high traffic pet areas. Keep a towel near the door and gently wipe your pet’s paws each time they enter the home from outdoors. A spray bottle of water is also handy for those times your pet gets a little extra dirty (or on rainy or muddy days). 2 – Dual action decor. Area rugs and runners can add a little pizzazz to a room, but they can also act as a dirt catcher. Placing area rugs or runners in high traffic pet area can limit the damage to the actual carpet. Strategically place the rugs so that the majority of the time the pet is on the rug, not the carpet. 3 – Keep them clean. The cleaner the pet, the cleaner the carpet. Keep your dog groomed and tidy and you will find that there is less mess that transfers to the carpet. Keeping the dog’s hair maintained also limits the amount of pet hair that will find its way to your carpet. 4 – Vacuum, vacuum, vacuum. Vacuum regularly to avoid hair and dirt buildup. Here is a great post we shared about various types of vacuum cleaners you can use to keep your pet hair build-up to a minimum. 5 – Don’t forget the furniture. Don’t forget to vacuum the furniture as well. Even if the pet does not get on the furniture, hair and dirt can make their way to the furniture by air or shake. Any dirt or hair on the furniture will eventually make its way to the floor. Therefore, when vacuuming, vacuum both the floor and use a pet tool on furniture and drapes. Be prepared. Even the most well-trained pet may have an accident from time to time. Having a simple pet stain remover on hand or handheld steam cleaner can do wonders. Be sure to get any solids removed as quickly as possible and dry the area thoroughly. The key to pet stains it to treat them as soon as possible. The longer they sit, the harder they are to remove. Baking soda can be used on pet stains to help eliminate or mask the odor. Baking soda does NOT, however, take the place of a deep carpet cleaning. 8 – Confine the issue. If you have an unruly pet or puppy, consider confining them to areas of the home without carpet. If the area is not large enough for all day confinement, utilize the area at night or when the pet has less supervision. 9 – Watch what they eat. Pet food comes in a variety of forms. However, many foods have artificial colors included. These colors can stain carpet and cause a messy cleanup should your pet have an accident. Instead, purchase food without added coloring for less mess. 10 – Call the professionals. Even with the utmost of care and consideration, pets can cause the carpet to just not seem as fresh. A professional cleaning can spruce up your carpet and make it look new again. 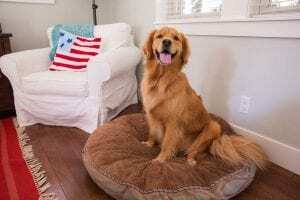 The Rug and Carpet Institute suggest that pet owners get their carpet cleaning at least once a year, or more if they have multiple pets or accidents. Carpet cleaning professionals like Carpet Keepers can also be called for particularly difficult pet stains or spot treatment and cleaning of heavily used area rugs. 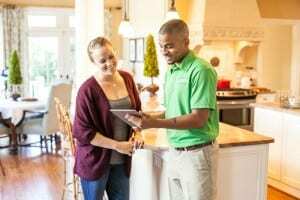 Did we mention that Carpet Keepers uses a systematic approach and is dedicated to improving your indoor air environment by using certified eco-friendly solutions that are safe for kids and pets? Carpet Keepers PureScience™ cleaning system, that has been measured, tested and are Green Seal certified. Contact Carpet Keepers today at (703) 737-3117 to schedule your carpet cleaning service for your pet-friendly home. Have you used Carpet Keepers services before? When was the last time you hired someone to clean your fabrics/floors?